In my opinion he's one of the strongest baddies. Cell is otherwise known as #21. His main purpose was to destroy #17 and #18 because of #20's death at the hands of them. 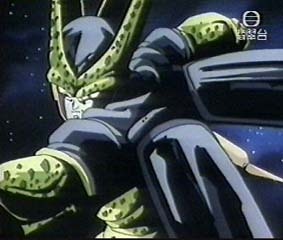 Cell has three forms, the third otherwise known as Perfect Cell. He can absorb anyone to become stronger. Cell can also rebuild himself with any part of his body alive. He's finally destroyed by SS2 Gohan.